Published: Oct. 19, 2015 at 07:05 p.m. Updated: Oct. 19, 2015 at 09:15 p.m. The world got to see Odell Beckham Jr. in primetime Monday night. 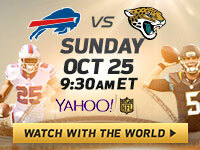 Watch with the world as the Buffalo Bills take on the Jacksonville Jaguars in the first ever free global NFL live stream on October 25 at 9.30 a.m. ET. The game is available across Yahoo on your phone, tablet, laptop, console or connected TV. For free! Beckham played against the Eagles after the New York Giants announced before the game he would be active. Beckham had been dealing with a hamstring injury suffered in last week's win over the San Francisco 49ers. The second-year stud sat out practice this week and was officially listed as questionable on Saturday. Hamstrings are tricky injuries for a receiver. Even at less than 100 percent, OBJ is a force on the field that opens up the Giants' entire offense. With a chance to bury the Eagles in the NFC East and take a commanding division lead, the Giants plan to have their superstar playmaker available at some capacity. In other Giants injury news, linebacker Jon Beason will play, per Jones. He was listed Saturday as questionable because of a concussion.